"I want to say thank you to Julie for all of the support and knowledge she gave me even before I attended the workshop. From the moment you meet her, you know you have made the right decision about where to get your certification. Julie's passion about childbirth is energizing and only makes you want to learn more. I am so proud to have accomplished my dream of being a childbirth educator. Thank you!" "I am so thankful for this weekend. I knew this is what I wanted to do but I am now walking away with the confidence and enthusiasm to do it and do it well. Thank you so much!" "Julie's CBE training provides an up to date, well rounded basis for starting to teach Childbirth classes. Her experience and knowledge in the field are extensive. What was more important to me is that the information is presented in an open,comfortable, sharing environment. Julie allows open discussion on topics and still keeps the class on task and focused. I loved that she walked us through planning our actual classes. For me, the marketing component was invaluable. She clearly cares about her students having successful businesses. Knowing exactly how to use the information you learn to go home and start a business, means you can dive right in. We left a roomful of empowered women on a mission to help families have great birth experiences." "The CAPPA CBE workshop was a very informative and inspirational experience for me. It has prompted me to broaden my nursing career goals to include any and all aspects of natural childbirth. Julie was warm, friendly, and very down to earth and it was a joy to meet her." "Julie is very passionate about her work as an educator. She's in touch with current topics in birth and childcare and has an in depth knowledge of birth statistics. But most importantly, her compassion for all women and their unique situations is what makes her the best teacher. She creates a gentle and healing environment within her classroom, one which frees the student or parent to express themselves and inspires true learning." "Right from the get-go, I knew Julie would be a wonderful teacher and mentor. Of course you realize her amazing knowledge level right away, but it's truly her inherently calm and practical approach to teaching childbirth topics that stand out the most to me. There is not a question she hasn't heard before and truly nothing rattles her. However, it's also evident that she keeps up-to-date on necessary research, making her trainings and classes very informative. I also like how Julie keeps classes moving and thinking via fun and innovative teaching concepts. I highly recommend Julie and Well Pregnancy to pregnant families and those seeking childbirth-related trainings." the group. It's immensely helpful and sometimes very affirming to learn about what others are doing in different parts of our region and country." 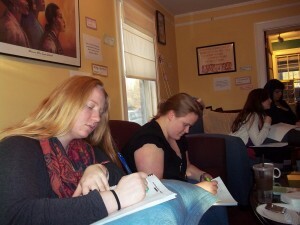 "I enjoyed the class and felt as though my opinion was valued. Each person brought something special to the class and Julie did a great job allowing everyone to share their knowledge. She remained unbiased and allowed lots of time for questions and answers."